Jeremy Corbyn, the most reviled ‘terrorist sympathiser’ in recent times, won a significant victory in Oldham last night against a backdrop of wall-to-wall media smears. The beleaguered leader defied his critics in spectacular fashion as Labour won a thumping victory in his first ballot box test. Local council leader Jim McMahon won with a 10,722 majority in the Oldham West and Royton by-election. UKIP are taking it with their characteristic good grace. Their leader took to @BBCr4today to announce: “There are big ethnic changes in the way people are voting” before blaming the Postal Vote. In a world where their leader has a virtual permanent place on the BBCs flagship tv show, and Corbyn is smeared and derided in every broadcast and from every media pore, in a world where fear and racism should play in to UKIP’s racists hands, they failed. But so too did the commentariat, who had been salivating for weeks at the prospect of a Labour failure. The Spectator has often led the charge. Two days ago Sebastian Paye wrote (‘Is Ukip on course to win the Oldham West and Royton by-election?’): “Corbyn’s leadership appears to dragging the party towards electoral oblivion, while Ukip is chipping away at the formerly solid Labour working-class vote in the North of England. Paye quotes the local UKIP candidate: “For me, it started to come into focus two weeks ago — what was happening with the Corbyn effect and the toxicity on the doorstep’. He says voters have told him Corbyn is ‘an idiot’ and he believes the consensus in Oldham is that ‘these people are not credible’. They did. Maybe grassroots politics sometimes beats media propaganda. It did in Scotland last year. The whole message has been clear: Jeremy Corbyn makes Labour unelectable. Now we know that’s just wishful thinking. This won’t stop them for a moment, they’ll explain it away as being due to local circumstances and hint darkly that UKIP might have a point. They scent blood and they’ve found the man to rally round in returning Labour to the establishment fold – Benn. It almost makes me think Corbyn is the genuine article – in which case he is doomed come what may! I must have missed John McTernan’s hindsight explanation for the Scottish 2015 election results. Can anyone send me a link or a summary? John’s summary would be – SNP baaad. Electorate are stupid and beguiled. I love Jim Murphy. Benn’s speech on Wednesday was directly contrary to his clearly stated position as recently as 15th November, and that was after the French atrocities, so his change of mind was not in response to the French position. Benn (no doubt encouraged by others) clearly saw an opportunity to oust Corbynn, and has behaved shamefully. His speech was impressive if bluster and misinformaiton are the criteria for a great speech, but not one of his justifications stands up to the slightest scrutiny. Just like Cameron’s position. He clearly stated a fortnight ago that the priority had to be resolution of the civil war in Syria and that would be the platform from which IS could be confronted. Nothing changed in the intervening period, except his mind. Cameron’s justifications for military intervention were being comprehensively debunked on a daily basis by a series of people across a broad political spectrum, people with more expert knowledge on the matter than Cameron, or indeed Benn. The lie about an army of 70000 was completely discredited, and is now right up there with the dodgy dossier. The Tories were positively gleeful and not even Benn can have failed to realise that they were cheering not for him or his vote in favour, (as that was numerically inconsequential), but for what they thought was a fatal blow to Corbyn’s leadership. I do not particularly like Corbyn’s leadership style but the members of the Labour party clearly mandated him with a huge vote in his favour. Democracy, it appears, is only acceptable in the Labour Party when it delivers results that suit the Blairite faction. The by election result may appear to signal an upturn in Corbyn’s prospect of survival but the media smear campaign will simply intensify. From my perspective I care little for the survival of labour, particularly in Scotland, but anything that weakens the Tory grip on the U K is welcome until we can actually remove ourself from the control of the U K Parliament. A shameful day for the U K parliament, ably aided and abetted by the MSM. ”A shameful day for the U K parliament, ably aided and abetted by the MSM.” Business as usual then. Benn’s long-winded theatrical effort (inclusive of key jingoist words like ‘fascist’) is simply reflective of an ex private schoolboy from a long line of ‘hereditary’ politicians with limited real-life experience, an over-inflated view of Britain’s relevance internationally and therefore totally unrepresentative of wider society. A red tory through and through. Scotland needs a debate at Holyrood on this decision so people can see the red tories among us, and to demonstrate our nation’s opposition further, to ourselves, to rest UK, and to the international community. Benn nicely speared. You can smell the hypocrisy from here. Hilary Benn went to a comprehensive school not a private one. Both his father, and particularly his mother Caroline Benn were passionate believers in the comprehensive system. Hillary Benn went to private school until secondary school. Then he went to Holland Park School, described as the socialist Eton. It’s amazing how many people fall for the great speech guff. It’s not the delivery that’s the problem. It’s the content! He is backing up the Tories and getting applauded for worshipping bombs. Benn’s Father will be turning in his grave. I’m looking forward to the great English Labour battle of deselection. Spot on John G — and Corbyn with the Daily Mail’s help has identified for Labour members exactly which constuency MP’s defied / ignored their wishes . I wonder how many deselections in the North of England. Who knows some may even defect to where they belong. Swivel-eyed McTernan must have his head on fire today. You can almost smell the Ozone from here. Yet another own goal from Labour’s over privileged ‘genius’. Following the adulation for Hilary Benns speech , Channel 4 gave loads of time last night to Tristram Hunt ( remember him?) Since when did the Tory party and their media pals get to decide who the next Labour leader should be? Just when you think it can’t get any worse . since when does an effective opposition vote with the government? I think that as long as Labour keep the current voting rules for leadership elections then Hilary Benn has sealed his fate. The membership won’t forget his shameful undermining of the party as an opposition. There is so much information out there on alternative news sights to blow the hawks out of the sky,namely Isil/Daesh is a creation of the USA/Israel/Saudi coalition,on the money trail Keiser says that the City of London is at the heart of the money laundering,no questions about this?? his latest guest Nicholas Kadoch states that they/Banks are the real power bullying governments of all/any political colour,he says that Blair should be tried in this country as a war criminal,I know it is a far too complex issue to understand nature of the beast I suppose.I don,t know how/why the SNP do not get on the case of rabidly bad the establishment is and expose them to the full. The complicity of Western Financial Institutions and governments in money laundering, syphoning off funds from developing countries, hiding corporate profits and individual wealth of rich and powerful individuals in tax havens etc has been written about for many years. See, among others, Capitalism’s Achilles Heel, Shaxson’s Treasure Islands, Tax Justice Network. I would hope an Independent Scotland would outlaw such activities and ensure people and companies pay their fair share of tax. That’ll be the day. Pretty much all of Scotland is offshore owned and has been for a long time: land estates, whisky firms, oil companies, banks, key infrastructure like major ports/airports, energy firms, even the private school ‘charities’ (and ‘elite’ uni’s) that ‘prepare’ the 5% ‘elite’ to ‘run’ Scotland are basically ‘offshore’ as far as tax is concerned. Scotland is just a ‘milk cow’ for unionist elites, that’s why its held so tight. It’ll take more than the SNP to sort that lot out. Odd that this is the first good word that Bella has said about Labour for ages. Labour – in this case – the best of a bad lot? Nothing matters to the Unionists they will not listen they will not learn they cannot discuss the issues,they are prepared to see their country “go to hell in a hand cart”singing “Fool Brittania/God save us fae the Queen”.The more I know about them the less I understand them. Corbyn is a survivor. He hasn’t survived this long in his unreformed state without knowing how far to push his luck. The commentariat grossly underestimate his surival skills and his new found followers are busy creating a fictional reputation for him as Mr good guy. If I didn’t know better I might think he was a wee fly Fifer. Labour members in Oldham got it ,when they selected Jim McMahon they made the best choice , a good local candidate worthy of voter’s respect and support. If there were a few candidates in Scotland from the same mould SLAB might just begin to re-attract voters. The only way they will attract voters it to reverse course , and that means a change in ownership to North of the border. The lies during the indy ref , of Browns Vow , offering less to Scotland than even the Tories, well that will take a very long time to negate. Labour promises during 17 years of Thatcherism , that never materialised during the Blair Bown years. The only way SLAB will rise again is through Corbyn North of the border , and that means one thing if total independence is off the cards , FFA. As SLAB and Corby like to roll out the father of the party at every opportunity , the omit one key thing that was a driving force in his doctrines , home rule…. not the chocolate teapot version they helped to supply , with their post indy poison chalices. To do this they have to apply a veneer of nationalism to SLAB , which is against the grain of the head office , and in the same manner as the SNP has veneered themselves more Socialist. Only FFA will do this and still keep any semblance of a Union…. creating something like the EU. They have to rebrand soon , or die off in Scotland at MSP at the same level next May as last , even the NuMessiah that is Corbyn will make no difference whatsoever. But to expect Corbyn , while on the rise , to put FFA on the table and political suicide for him in England , thus is a non starter. Labour will be happy to throw the SLAB sandbags a few p45s as collateral damage, if not all of them , just like Milliband did. Thus the only option left is total autonomy for SLAB as a party , just the same as for Scotland fiscally , oh the irony. Like many other fair minded people I began to doubt my own fairness and objectivity during and up to the final days of the September 18/09/14 Scottish Independence Referendum. Could it really be that over 95% of the MSM and particularly the BBC were anti Scottish Independence and anti SNP? After all we are talking about hundreds of highly educated and knowledgeable people here employed by the MSM and the BBC. People who probably joined the profession because of a desire to tell the public the truth, well at least a high percentage of them probably did. Perhaps I was being paranoid simply because I firmly believe that Scotland is well able and would be far better off running it’s own affairs and looking after it’s own people and anyone who said otherwise must be wrong or convince me with a better argument. However recently I was watching or listening to one of these “What the Papers say programmes” and one of the contributors, who was a reporter or correspondent for one of the big Southern British newspapers, caught my attention with remarks he was making about Jeremy Corbyn. In summary he was saying Jeremy should be concentrating on telling the people about how less than 5% of the UK population now own Trillions of Pounds, more than 95% of the total UK wealth and this is destroying and depreciating what used to be the middle class. Thus setting the UK back to a Victorian style world of absolute wealth for less than 5% of the population and austerity and poverty for the rest. Then I thought, you, the reporter, are supposed to be an investigative journalist telling the people the truth, so why are you not doing it in articles for your newspaper. Which brought me back to the Scottish Referendum because the same MSM and BBC who were over 95% anti Independence and anti SNP are now currently anti Corbyn. Why then would hundreds of highly educated and knowledgeable people not have different views and opinions, why does it seem to be such a well-co-ordinated attack on anything that may threaten The Establishment. This can be backed up by recent comments from The Establishment, regarding Jeremy Corbyn as a “Terrorist Sympathiser” and being a threat to our National Security. Perhaps the answer is – if less than 5% control the wealth, power and influence they also control 95% of the output from the MSM and BBC and the jobs of those hundreds of highly educated and knowledgeable people who are currently part of the middle class. Is it possible they are more worried about jobs than truth? Maybe I was not so paranoid after all. I wasn’t around in the early days of Labour but the idea of ‘home rule for Scotland’ was never going to be sustainable within a British Labour movement – the two ideas are simply contradictory. There’s no need to delve deeply into why, it’s obvious. That is why Brown, Miliband and now Corbyn are diametrically opposed even to meaningful devolution of power to Holyrood. We must never forget that this is Corbyn’s position and his actions since his becoming Leader of the Labour Party have reinforced this. He would never countenance Scottish self-government, not because it would be political suicide but because he is ideologically opposed to it. I agree with C Rober that the only future for Slab is absolute autonomy but that is not going to happen. What is left of Slab is just the true Brits and they despise the very idea of independence – of any kind. Instead, under instructions from London and with full-on media support – including some in the alternative media, they are going to try to hold onto what little they have left until their betters get their act together. 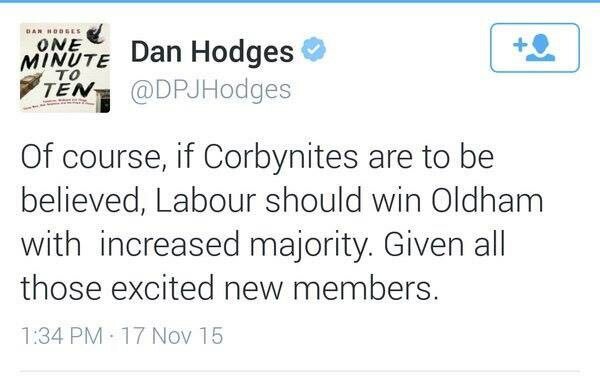 The result at Oldham may be a great encouragement to some of the Slab faithful and a great disappointment to others, depending on whether or not they are red tories. Then again, as is the Labour way, they may all just be happy that their Party has won a seat and they will work out later what they are going to do with it. A win is a win after all. I’m not entirely sure the irony in your closing statement is intentional…. Grassroots politics did not beat media propaganda last year. What it did was lose by a closer margin than the media expected. We should all be wary of too much wishful thinking.